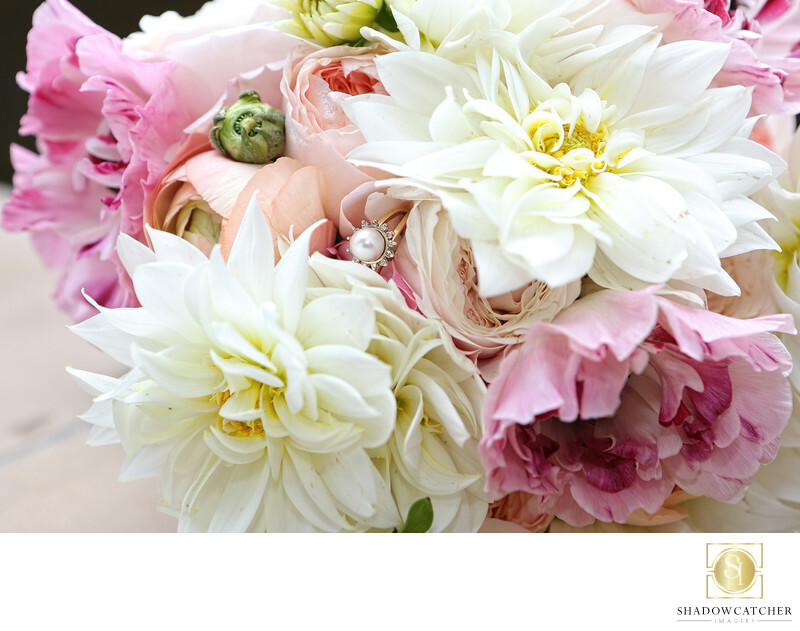 Flowers are a way to both beautify a wedding and tie it together, visually. Flowers represent the colors the couple has chosen for their decor, give texture to the venue and often even provide a delightful fragrance, too. They also are used by the bride to make a gentle statement about the day, a loved one or a memory. Here, as a special memento, the bride had her grandmothers cocktail ring added to her bouquet, reminding her of those who cannot be there on her special day. Getting photos of details like this are fun and easy with the right lens and camera. Learning to bend and utilize light makes the images outstanding. This one is lighted with a combination of window light and flash bounced off the ceiling above the bouquet, which gives it outstanding texture.